Mobile gadgets are the future of consumer technology. Unfortunately, most of us are limited to viewing on-the-go content on the relatively tiny screens of smartphones, tablets and laptops. So, what if you could carry around the equivalent of a 75-inch television anywhere you go? Would you do it? Because that’s exactly what near-eye display (NED) maker Vuzix promises with the Vuxiz Wrap 1200 display glasses. Does the Wrap 1200 really deliver a big-screen experience? We went hands-on to find out. Setting up the Wrap 1200 is surprisingly easy — basically, you just turn them on, plug them in, sit back and watch your video. 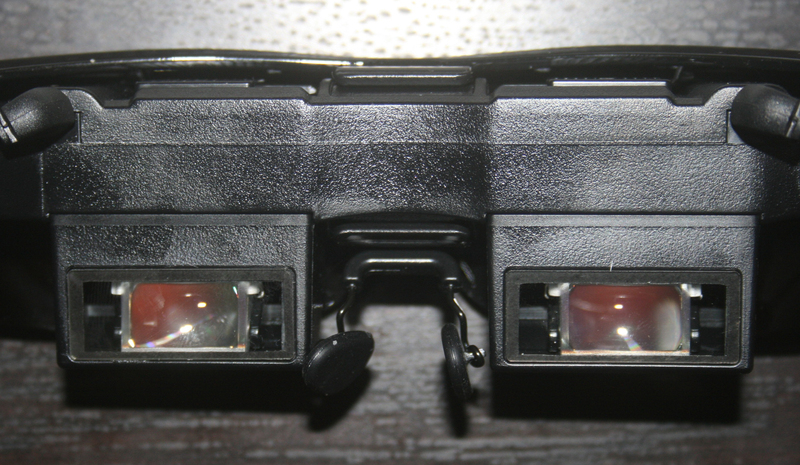 A small box containing two AA batteries powers the glasses, and also has all the controls. Vuzix smartly packs the Wrap 1200 with a pair of rechargeable batteries, and a battery charger that plugs into any USB port. Vuzix claims the glasses deliver five hours of video playback on a single charge. Right out of the box, we found that estimate just about on point — we watch just about four hours of video before we had to recharge. The glasses plug into the control box, as does one of the variety of input connectors that also come with the Wrap 1200. They include standard A/V (for DVD players, etc. ), component (for gaming systems or Blu-ray), mini HDMI, and even a 30-pin connector for plugging into any of Apple’s variety of iDevices that offer video playback, including the iPod Touch, iPhone and iPad devices. 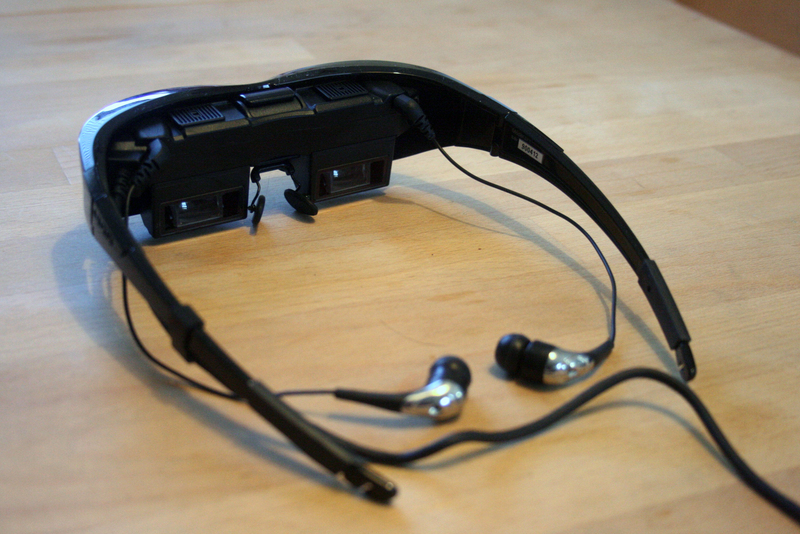 Also included with the Wrap 1200 is a pair of noise-canceling headphones, which plug directly into the glasses. If you’re using an iPhone or other iDevice, you can also simply plug your headphones into the headphone jack and skip the Vuzix headphones altogether. There’s no way around this one: The Wrap 1200 glasses look ridiculous. Yes, there’s a bit of a sci-fi charm to them, with the shiny, impenetrable black “lenses” (which simply cover up the screens and other components — you cannot see through them). Still, you’re not going to win any fashion points wearing a pair of these things. Fortunately, looking cool is not the purpose of the Wrap 1200. When we first opened the box, and saw the controller box, the headphones, the cord from the glasses to the controller, and the other cord from the controller to whatever it is you decided to plug the Wrap 1200 into, it seemed like far too much to deal with. In reality, however, we were pleasantly surprised by how easy it was to manage all the different bits and pieces. 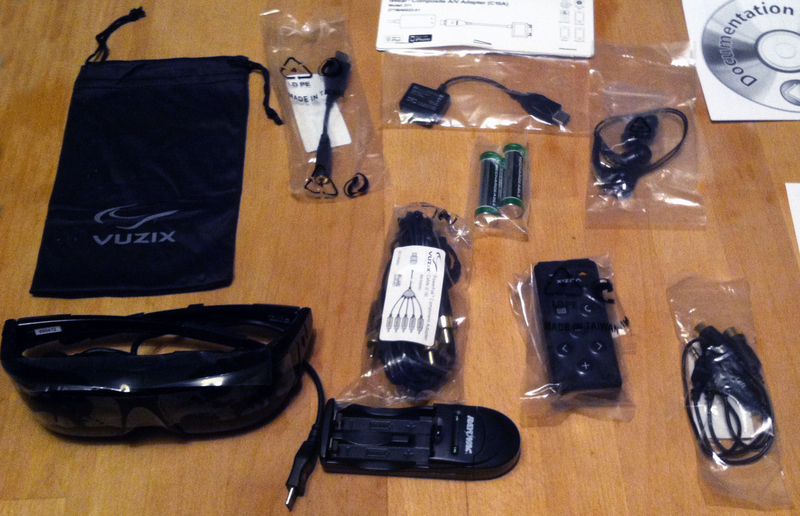 Vuzix also gives you a little black bag you can pack all the various components into, to keep from losing them instantaneously. Of course, the real question is: Does it really look like you’re watching a 75-inch TV? And the answer is… yes, actually, it does. In fact, it’s almost more like watching a movie in a theater, from a seat in the back half of the room. The Wrap 1200 has two screens, one for each eye. Each screen has a resolution of 852 x 480, which gives the image quality a fairly high resolution. Does it look as crisp and clear as watching a movie or TV show off a high-end projector or on a high-definition plasma television? No, not even close. But it does look as though you’re watching a fully-immersive screen that measures at least 75-inches. 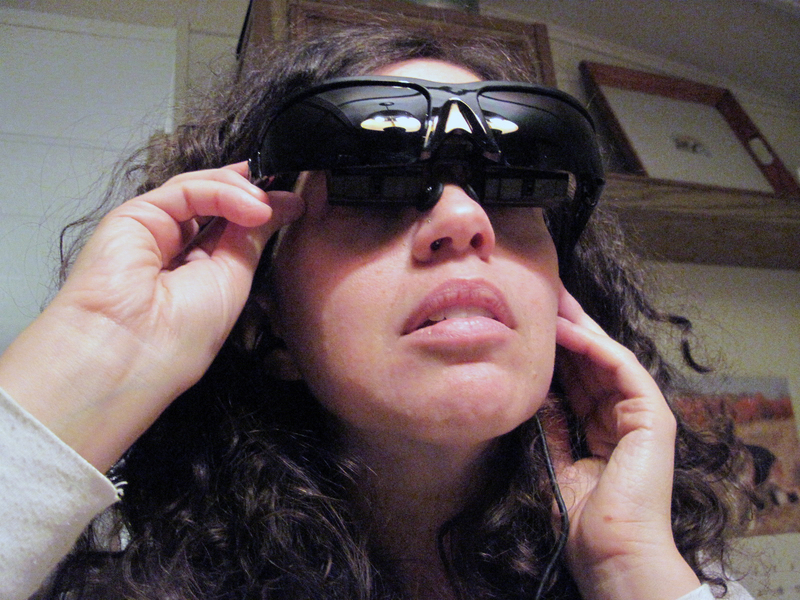 We were pleasantly surprised by how enjoyable it was to watch movies on the Vuzix. During the first test, which was only supposed to last about 20 minutes, we ended up watching an entire movie from Netflix via our iPhone 4. After the first 15 minutes or so, we completely forgot we were wearing a pair of silly-looking video glasses. There are, of course, a number of downsides to the Wrap 1200. First, it is a bit difficult to get the glasses to fit properly. While the screens can rotate up or down to adjust for an optimal viewing angle, the entire contraption still fits rather awkwardly on the face. It’s possible that some of you out there have a mug perfectly suited for the design of the Wrap 1200, but we apparently don’t. Second, the world around you is fully visible in the lower part of your visual spectrum. That is to say, if there is a lot of movement happening around you, or you’re trying to watch in a very bright room, you’re probably going get annoyed with this device. Vuzix does make a “Lightshield,” which is made of rubber and fits over the Wrap 1200, but it’s not particularly well designed. Or, at least, we were too dumb to figure out how to attach them properly. One feature we didn’t get to check out was the Wrap 1200’s 3D playback capabilities. Unfortunately, we didn’t have anything that played 3D video to conduct this test. Since the image quality of the Wrap 1200 is solid, we imagine that 3D looks pretty good. Since we didn’t test that feature, however, that’s simply a guess. Before we can say anything definitive about the Wrap 1200, it’s important to point out the price: $499. That’s right, these things cost as much as a low-end iPad 2. Because of this high price-point, we can’t fully recommend the Wrap 1200 to everyone. Yes, they are good for watching video content while on an airplane, bus or riding in a car. But for most people, we’d recommend just going with that iPad 2, which has a smaller-than-75-inch screen (9.7-inches, to be exact), but also does a whole lot more than just play videos, and is actually easier to cart around on trips. If Vuzix wants to break into the mainstream, it’s going to have to significantly reduce the cost of its display glasses. (Not to mention making them look less absurd.) Fortunately, the company recently signed a partnership deal with Nokia to develop the next generation of NEDs, which should help move the company toward that goal. The first NEDs to pack the advanced Nokia technology will ship early next year — to the U.S. military. Travers says the company is still working out when the next-gen NEDs will be available for the consumer market. But unless you have $500 burning a hole in your pocket, we’d recommend waiting until then to pick up a pair.